With more amusement park rides than any other state, Pennsylvania is a hot spot for family-friendly fun and thrilling rides. Famous parks like Hersheypark, Knoebels, Sesame Place, and Kennywood draw children and adults alike from all over the nation. But what happens when a fun day at the park turns into a nightmare? That’s what happened to Pennsylvania resident Robert Trostle when he visited Kennywood last July. According to Trostle, he was splashed with contaminated water on a water ride and contracted a painful, eye-eating parasite as a result. After getting eye surgery to treat the condition, Trostle still deals with symptoms, including pain, dry eyes, and blurry vision. For his pain and suffering, Trostle demanded $35,000 from Kennywood in damages. While injuries at amusement parks are relatively rare, they do happen. If you have been injured at a Pennsylvania park because of someone else’s negligence or a defective ride, you deserve compensation. In this blog, find out whether you have a legal claim to file a personal injury lawsuit. Negligence is one of the most common reasons for a personal injury lawsuit. When discussing your case with your lawyer, mention anything you did that might have contributed to your injury. Leaving out details could hurt your case and impact your settlement. The park didn’t post warning signs on rides that are not safe for certain groups, such as pregnant women or people with heart conditions. The ride operator didn’t follow proper safety protocols, such as checking everyone’s lap bar. The maintenance person neglected to inspect the ride as often as they should have. Ride operators and other park employees could be responsible for your injuries in many other situations as well. The best thing to do is consult with a lawyer experienced in personal injury law. However, you need to know that not all states handle negligence lawsuits the same way. In some states, plaintiffs cannot receive any compensation if they are even 1 percent at fault. In other states, the plaintiff could be 99 percent at fault and still receive damages. Pennsylvania falls somewhere in between these two jurisdictions. Its courts follow the 50 percent Bar Rule, which means injured plaintiffs can seek compensation as long as they are equally or less responsible for the injury than the other party. In addition, the plaintiff’s compensation amount is reduced by the percentage they are at fault. For instance, say you are seeking $40,000 in damages because you were injured on a roller coaster that the amusement park failed to properly maintain. However, you didn’t comply with posted height or weight restrictions on the ride, and your negligence contributed to 10 percent of your injury. In this case, your settlement would be reduced to $36,000. Work with a lawyer so you know how much compensation you may be eligible for. Lap bar that doesn’t latch, ejecting the passenger. As with cases of negligence, your actions can affect your compensation amount. However, you may still be entitled to money that will help you pay for medical bills, lost time at work, and other injury-related expenses. 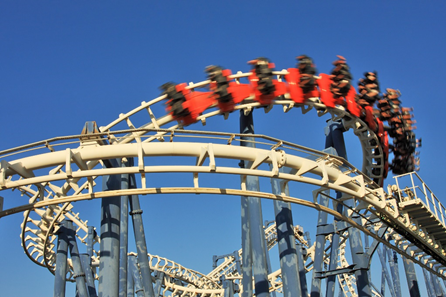 To learn more about your rights after being injured at an amusement park, talk to a lawyer at Clearfield & Associates. We can guide you through the nuances of personal injury law in Pennsylvania.